It is the goal of Mamais Construction to provide the safest job site possible for our employees, subcontractors, and the general public. Due to the importance of keeping a safe and clean environment, general precautions are always taken to ensure the safety of everyone in the area. 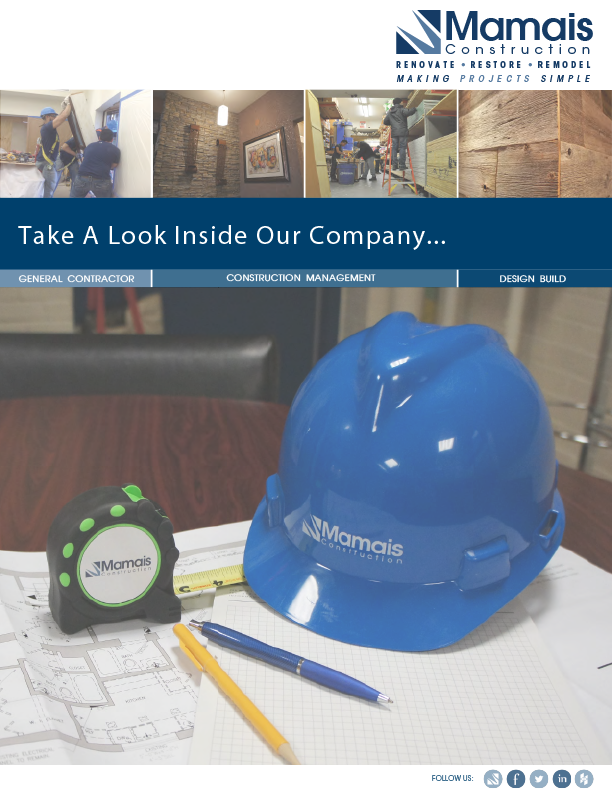 At Mamais Construction, it is our belief that a thorough safety plan and policy in effect on our jobsites is an integral part of the construction process. Employees are our most important asset, and the safety of our staff is recognized as a very real obligation. As a General Contractor, it is our mission to promote a safety culture and pro-active environment that will effectively identify and manage risk through recognition, evaluation and education of our employees, subcontractors and clients. We intend to not be merely in compliance with federal, state, and local safety regulations but to incorporate the latest professional safety practices to ensure every worker goes home safely. We realize the importance of preventing accidents that lead to jobsite injuries. Company management and all employees are committed to the performance of their duties in a safe manner and collectively maintain a safe work environment on all jobsites. The purpose of our Safety Program is to demonstrate our commitment to safety and to provide a guideline for management personnel associated with company projects which outlines specific procedures and rules to be followed. In all cases, OSHA regulations and other applicable standards are observed and maintained as a minimum standard. Our employees also receive continual safety training in the use of scaffolding, OSHA 10, as well as specialized training when required.